All Media posted Friday December 22, 2017. In the richest 360 A Main in Australia names are already starting to roll in for the show and with $10K on the line for the winner it is no wonder. USA’s Cory Eliason winner of last years All Star Challenge is back in Australia and will be looking for a back to back win in this year’s 8th running of the show. Eliason is again driving for the SA based Currie Racing Devil Race Karts USA00. Terry McCarl has also locked in and will want to step it up one position on last year’s 2nd. 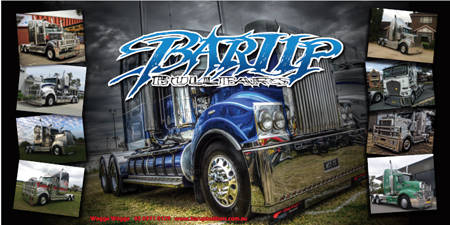 McCarl is driving the Melbourne Stainless Team USA24 ART based in Bacchus Marsh for the show and will also be competing in the Classic the weekend after. McCarl is looking forward to running at the ‘Avocado shaped’ track as he affectionately named it last year. West Australian based newcomer to the Series WA96 Aldo DePaoli is another to nominated early. DePaoli has been running a 410 in Victoria this season but is no newcomer to 360’s being a regular competitor with 360s back in W.A. Ex Series Champ Mark Caruso’s SA33 and recent winner of the JSR King of the Rivers has indicated his intent to run back at Simpson after a few season absence. With $10,000 for 1st, $2600 -2nd, $1800-3rd, $1500-4th, $1200-5th, $1000-6th back to $600 just to start the A this is a fantastic payout for 360 teams. A total of $27K being paid out on the show. Any competitor interested in competing is welcome and we would love to have you be a part of the 8th Annual Challenge. “This is pretty exciting for both the All Stars and Simpson and puts us right up there with other major sprintcar events in January. It is the first $10K to win show we have run and shows our dedication to the annual event which is held the weekend before the Grand Annual Classic. It kicks off a week of major race meetings in the state with the Presidents Cup being held at Avalon and the Kings Challenge at Mt Gambier then finishing at Warrnambool with 3 nights for the Classic.” says Mandy Searle. Mainline DynoLog Dynamometers Annual All Star Challenge is being held at Heytesbury Stockfeeds Simpson Speedway January 13 2018 and to help celebrate the series. Nomination Forms are available from www.sprintcarallstars.com.au and can be emailed to [email protected] or faxed to 03 9338 7476.